What are the main sources of vitamin C for guinea pigs? Why do guinea pigs need Vitamin C and how much? 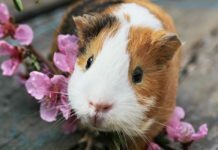 Follow our guide on guinea pigs and vitamin C, giving you all the advice you need for your pet cavy to stay healthy! Why is vitamin C for guinea pigs so important? Vitamin C, a water-soluble vitamin, is necessary for the growth and repair of connective tissues. It is also involved in body functions such as wound healing, the immune system and the maintenance of bones, cartilage, and teeth. Why do guinea pigs need Vitamin C? 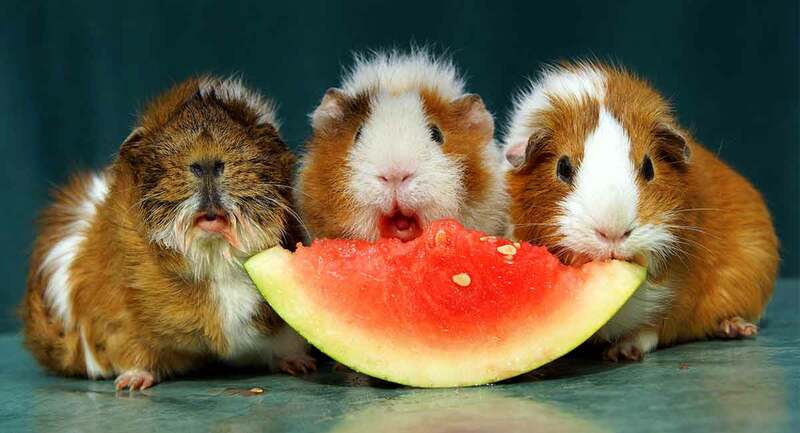 In contrast to other animals, guinea pigs, like humans, are unable to produce Vitamin C on their own. This is because they are missing an essential enzyme needed for the body to make Vitamin C.
Providing enough vitamin C for guinea pigs so that they maintain good health is a vital part of caring for your cavy. If a guinea pig doesn’t receive adequate amounts of Vitamin C, it will fall ill with scurvy. There are some guinea pigs who develop a Vitamin C deficiency even when they are receiving enough Vitamin C in their diet. This deficiency is often due to other ailments or conditions. If your guinea pig displays any of the above signs, take him to your vet immediately for a full diagnosis and a possible course of Vitamin C treatment. We know that Vitamin C for guinea pigs is vital to their health and well-being. What are the best sources of vitamin C for guinea pigs? Most high-quality guinea pig feed pellets add Vitamin C during manufacturing. However, this type of feed should be stored in a cool, dry place and used within 90 days of production as the Vitamin C degrades over time. You can also buy pellets with a stabilized form of Vitamin C which last up to 270 days. In addition to feeding pellets, good sources of vitamin C for guinea pigs are in certain fruits and vegetables and vitamin C supplements. Supplying enough vitamin C for guinea pigs to stay healthy can be done in several ways. Always choose a high-quality guinea pig food which contains vitamin C and follow their feeding guidelines. Providing a daily cup of leafy greens is an excellent source of vitamin C for guinea pigs. Other fruits and vegetables can occasionally be offered to add variety to your guinea pig’s diet. Fruits should be fed more sparingly, as they are high in sugar. Supplements of vitamin C for guinea pigs are available in either tablet form, liquids, or drops. Many pet stores sell vitamin C drops which can be used in your guinea pig’s water. However, these types of drops cannot be recommended, as there is no way of knowing how much your guinea pig will ingest. It can alter the taste of the water too, making your cavy reluctant to drink and therefore risking dehydration and vitamin C deficiency. Studies reveal that vitamin C degrades when exposed to light and water with only 20% remaining active after 8 hours. An excellent source of vitamin C for guinea pigs is a vitamin C supplement. You can buy vitamin C supplements in the form of a tablet that is specially designed for guinea pigs or use human vitamin C tablets. Vitamin C liquids for humans are also used, placing drops directly into the guinea pig’s mouth by using a dropper or syringe. Half a teaspoon is enough for your pet. 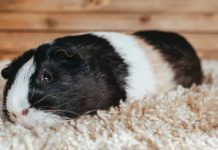 Never use supplements after their expiry date as they are unlikely to contain sufficient amounts of Vitamin C.
Avoid giving multivitamin supplements as these are toxic for guinea pigs, leading to possible complications. When giving guinea pig vitamin C tablets, many cavies will eat one when offered as a treat. If you use a human 100mg vitamin C tablet, only give a quarter to your cavy. You can also crush the tablet up then sprinkle it over vegetables or feed pellets. Hay doesn’t contain enough vitamin C for guinea pigs but should be fed in unlimited quantities to aid digestion and limit teeth growth. 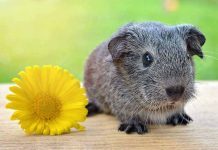 Therefore, small servings of fresh vegetables along with some fruits containing plenty of vitamin C for guinea pigs are the best types of food to give your pet in addition to his pellets. 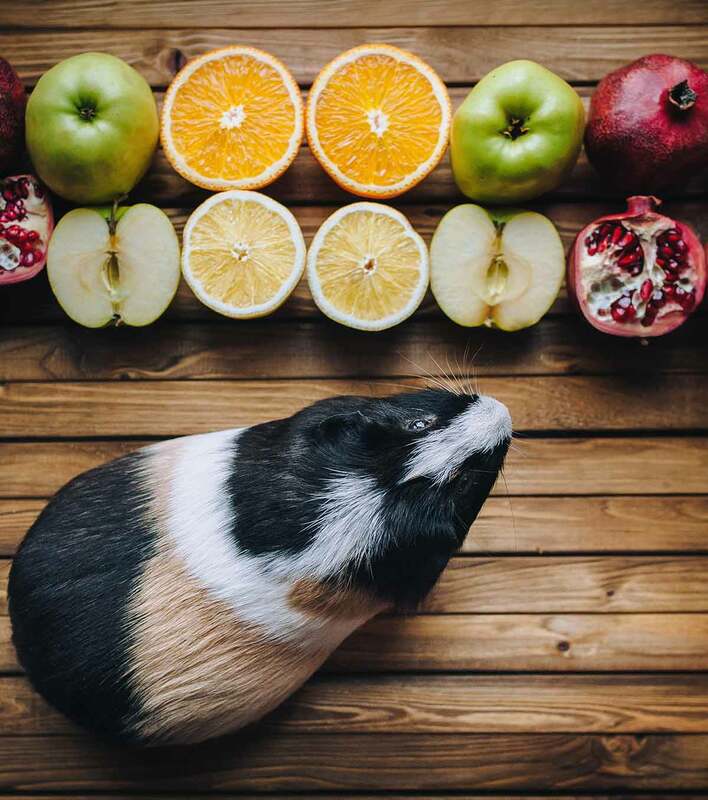 Provide a variety of different fruits and vegetables every day,otherwise it can cause your cavy intestinal problems if they always eat the same thing. One cup of fresh vegetables can be offered to your guinea pig daily. Fruits contain high levels of sugar so should be fed sparingly, keeping the portions small. Always feed fresh fruit and vegetables, so your guinea pig gains the maximum nutrient content available. Introduce any new fruits or vegetables gradually to your cavy to prevent diarrhea. How much vitamin C do guinea pigs need? The average guinea pig requires 30 to 50 mg of vitamin C daily, more if they are pregnant, nursing, sick, or young. Because vitamin C is water-soluble, it does not get stored in the body. The body will use what it needs with any excess sent out of the body through urine, so it is hard for a guinea pig to overdose on vitamin C.
The best sources of vitamin C for guinea pigs are provided by feeding high-quality pellets that contain vitamin C along with a daily intake of suitable fresh fruits and vegetables and a vitamin C supplement. Consult your veterinarian with any concerns you may have regarding your guinea pig and vitamin C.
Oxidative decomposition of vitamin C in drinking water. Effect of mechanical force on the skeletal lesions in acute scurvy in guinea pigs. Previous articleAre African Pygmy Hedgehogs Good Pets? Next articleCan Rats Eat Grapes As A Tasty Fruity Treat?